Tuscan Gnudi (ricotta and spinach gnocchi). I love Italian potato gnocchi but I think I love Tuscan gnudi more! Gnudi (also known as malfatti) are basically gnocchi made with ricotta instead of potatoes! They are very traditional in Tuscany where they usually make them with spinach too. Ricotta and spinach gnudi or malfatti (in Siena and Arezzo) are a typical first course (primo) in Tuscan cuisine. They are very traditional in the Maremma and Mugello regions. These wonderful dumplings are prepared with the normal filling for ravioli (or tortello in the Maremma) but without the external pasta dough. This is actually why the Tuscans call them ‘gnudi’, which means naked or undressed in the Tuscan dialect! The word ‘malfatti’, on the other hand, means badly made and refers to the rustic look of these delicious dumplings! In other parts of Italy, they may also be referred to as just ricotta and spinach gnocchi. 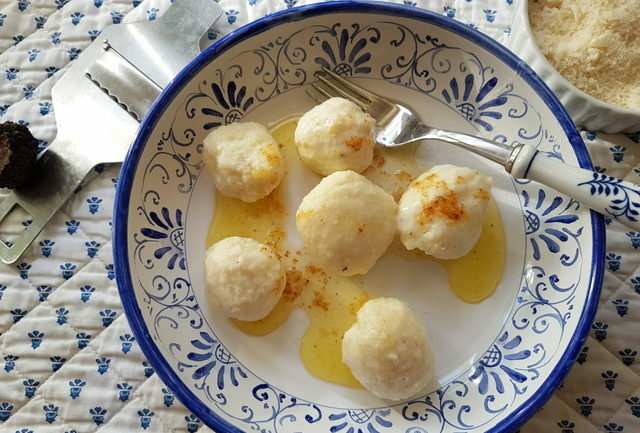 Although, Tuscan gnudi look more like quenelles or small canederli (dumplings from Trentino-Alto-Adige). 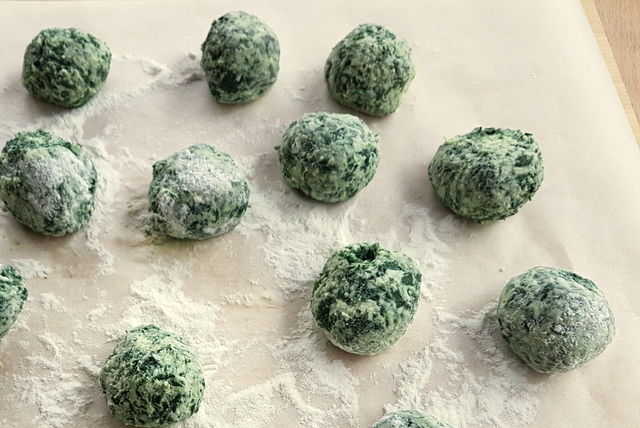 Also spinach and ricotta gnocchi often contain more flour and look more like potato gnocchi. Many Italians roll gnocchi made only with ricotta (no spinach) along an gnocchi board or the tines of a fork to create ridges. Gnudi or malfatti are too soft to have ridges. 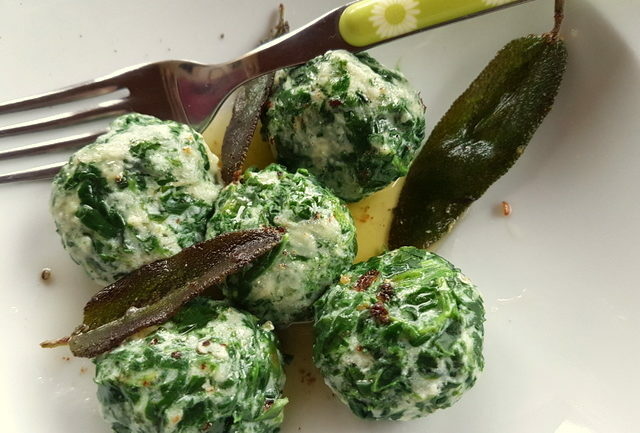 Every Tuscan family has its own gnudi recipe, with varying proportions of ricotta and spinach. Some people use sheep’s ricotta, others cow’s milk ricotta. In addition, some recipes recommend that you use chard or nettles instead of spinach . 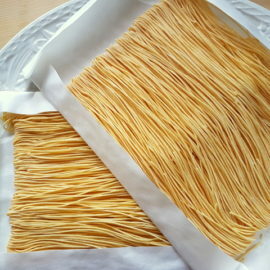 Others do not add flour to the mixture or coat the gnudi in flour before throwing them into boiling water to cook. In addition, there are many recipes for just ricotta gnudi without spinach and also divinely delicious. How to serve Tuscan gnudi. Traditionally Tuscan gnudi are served with a sage butter sauce like in this recipe for homemade pumpkin gnocchi. 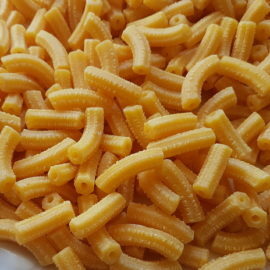 However, they are really good with a homemade tomato sauce or even ragu. One of my favourite ways to eat gnudi is in the oven (al forno). For this dish, the gnudi are usually cooked first and then baked for a few minutes sprinkled with grated parmesan and breadcrumbs. Another way to bake gnudi or malfatti is in a tomato sauce with mozzarella and Parmesan. This type of recipe is often called alla Sorrentina and is a popular way to serve potato gnocchi in Naples. 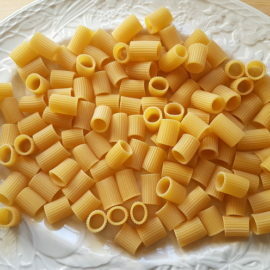 Recipes on The Pasta Project. 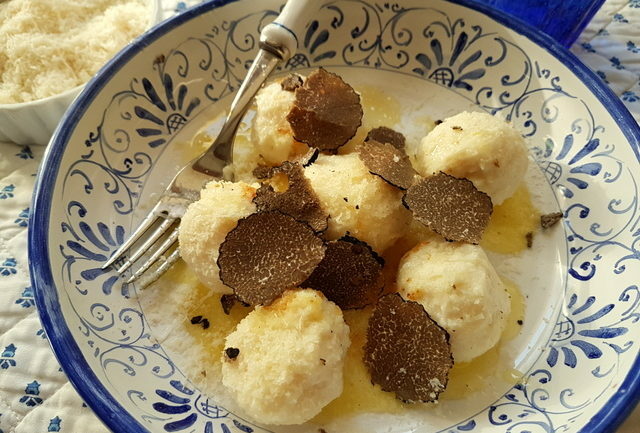 The first recipe I made with these Tuscan gnocchi here on The Pasta Project is for ricotta gnudi with black truffles. I didn’t add spinach because we had these wonderful black truffles to use and I felt the spinach would ‘spoil’ the flavour of the truffle. 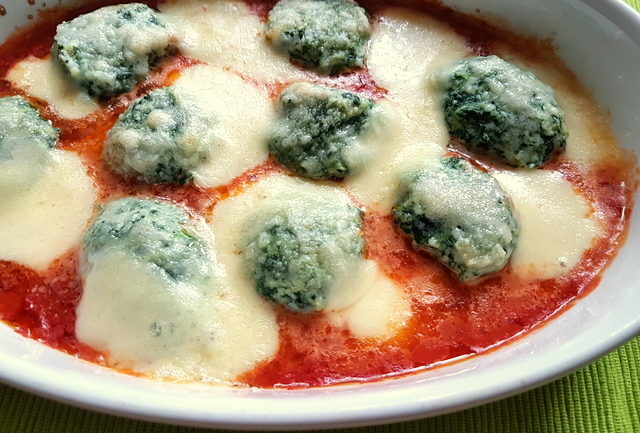 The second recipe is gnudi with spinach baked in a homemade tomato sauce with mozzarella. This second recipe also includes how to serve the gnudi with a sage butter if you prefer not to bake them. All absolutely Amazing with a capital A! Watch spinach and ricotta gnudi being made in Tuscany in this video from Pasta Grannies.